GIFs are fun to share. It feels like there’s one for almost every different set of circumstances. But did you know that it’s not particularly difficult to create your own moving pictures? This is equally true for mobile devices, as there’s a wealth of GIF-making apps for Android and iOS. Giphy’s GIF Maker tool first graced our desktops back in 2015. It allows you to create your own animated GIFs from YouTube links, or from your own content. Now, it’s available for mobile devices, so you can create the perfect reaction video whenever you’re out and about. This makes sense, when you consider that people are increasingly making and sharing content from their handsets. And as you’d expect, it lets you add your own flair, in the form of captions, stickers, drawings, or glitter. It’d be weird if you couldn’t. Giphy’s GIF Maker is the newest item on the list. And since it runs in the (mobile) browser, it’ll work on pretty much any Android or iOS device you’re likely to throw at it. Facebook has long approached GIFs with a sense of trepidation. But after dipping a toe (or is it a thumb?) into the water, it’s now jumping in feet first. Earlier this month, it overhauled the Facebook Camera with a new GIF mode. This lets you create your own original GIFs, and adorn them with an array of Snapchat-style stickers and filters. GIFs have a maximum length of 2.5 seconds, and can be uploaded to Facebook, or saved locally to your device. What I like about Facebook’s offering is that pretty much everyone has it installed on their phones, making it perhaps the most ubiquitous mobile GIF maker on the market. It’s hard to imagine Tumblr without the GIF. While Facebook is trying to position itself as a place for GIFs, their true spiritual home is Tumblr; the blogging site first launched by David Karp, way back in 2007. Therefore, it’s hardly a surprise that the official Tumblr app (Android, iOS) comes with a built-in GIF maker. While it’s not as tricked-out as GIPHY or Facebook’s offering, it gets the job done. Live GIF (iOS) is a favorite of Matt Navarra, our social media maven. Available exclusively on iOS, it lets you turn live photos into GIFs. Live photos were introduced with the iPhone 6S. Essentially, the feature allows you to capture a few moments of sound and video when you take a photo, in turn allowing you to create an interesting GIF-style effect. Live GIF essentially makes these a lot more portable, allowing you to share them on other platforms, like Facebook, Twitter, and Tumblr. The biggest advantage of this is that it doesn’t require you use a third-party camera app. GIF Toaster is another conversion app, available exclusively on iOS. 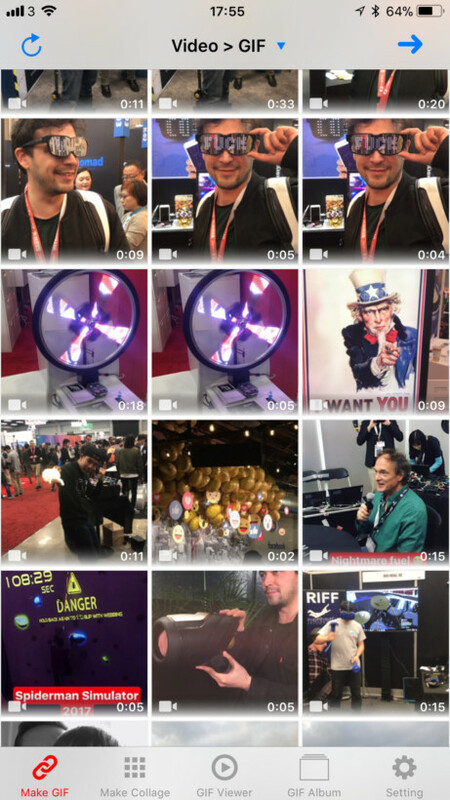 In just a few taps, it lets you turn videos, stills, and burst and live photos into GIF images, which you can then upload to the Internet. 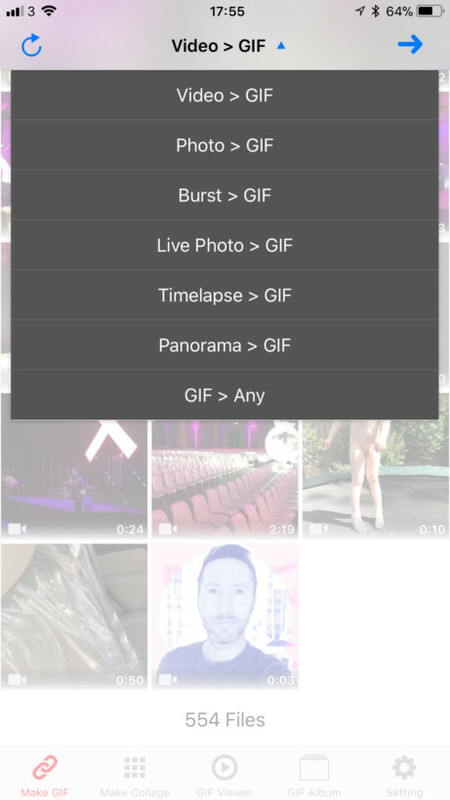 The app also allows you to convert GIF files into other formats. So, if you download a GIF and you want to convert it to a video, you can. Another feature is collages, which are exactly what they sound like. GIF Toaster is free, although you can unlock the features of Gif Toaster Pro with an in-app purchase of $1.99. It feels appropriate that we’d conclude this rundown with a look at GIPHY Cam. This app a fan-favorite, and allows you to create and stylize your own GIFs, and then share them online. GIPHY Cam lets you record your own video or slow-motion burst mode GIFs. Alternatively, you can upload your own video. Then, through the app’s tricked-out editor, you can add filters and effects, and either share your creation, or save it for later. GIPHY Cam is free, and available for Android and iOS. As a dedicated app, it’s way more advanced than the browser-based Giphy GIF Maker, and comes with all the tools a GIF power user would need. While the world is divided over whether it’s pronounced with a hard ‘g’, or a soft ‘j’, we can all agree that there are some pretty compelling GIF-making apps here. Did I miss any? Leave them in the comments below, and I’ll check them out.